The cake was a Topsy Turvy cake 10" 8" 6" cake the bottom cake was filled with cotton candy flavor filling. The middle cake was made with raspberry filling the top cake was made with butter cream. 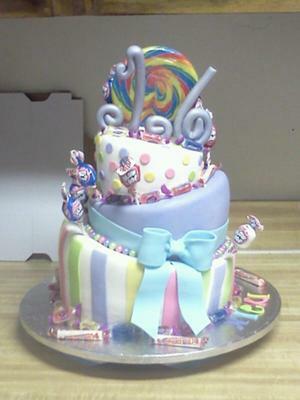 The tier cake was made with vanilla flavor fondant and I added lots of candy.